Our administration and user interfaces are web based, detached from the underlying server technology, ensuring the exact same look & feel irrespective of the server technology. Any computer that has a web browser can interact with PaperCut! Users are presented with the same popup windows no matter which computer they log on to, requiring no re-training when transitioning from, say, Windows to Mac. In the face of an evolving IT infrastructure both PaperCut server and client components can be seamlessly transitioned from running on one operating system to running on another providing users with continuity in day-to-day printing. Not just cross-platform... true multi-platform! 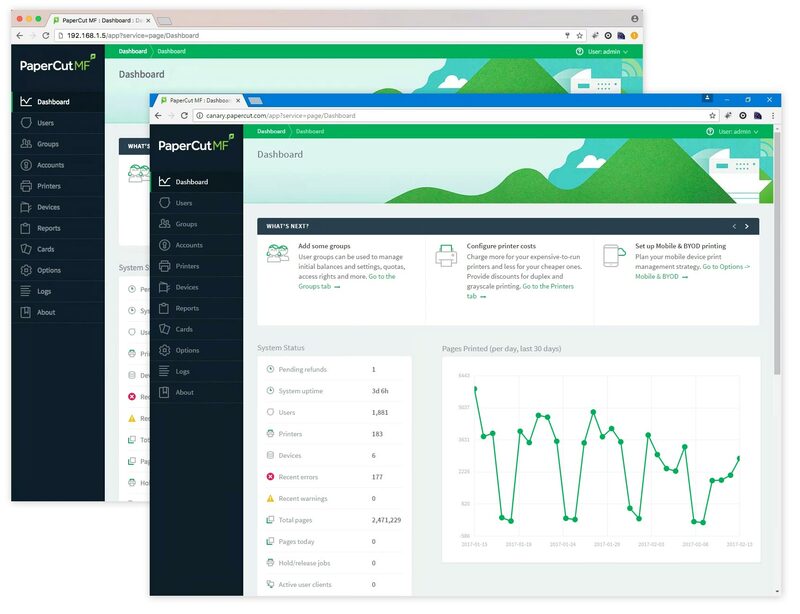 PaperCut is able to support multiple server platforms on the one network all working together. Many of our larger university sites choose to deploy PaperCut on one platform but host print queues on a mix of others. Platforms like talking "their language" but PaperCut talks all platform languages. Windows desktops can print to Windows queues, the Macs can print to Mac server queues, etc. A license for PaperCut allows you to run any of the components on any of the supported operating systems. Changing platforms is not an issue and there is no need for any additional purchases. See the Fair section of the tour for more on licensing.